Perhaps a timely postlude to the introduction of a new class of public transport in Kerala, the classy Volvo 8400 low floor A/C buses conquering the regal roads of Trivandrum! 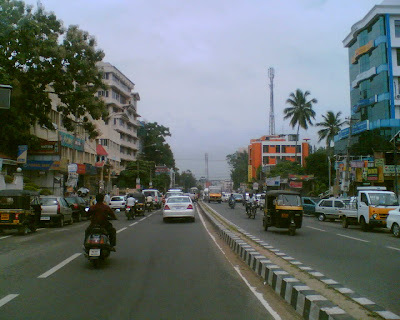 Exclusive pictures and report on Trivandrum Rising blog! The Kerala capital has chosen to tick the BRTS option for the Mass Transit of its populace. Well n good! Its an appreciable step forward, and something I believe, every city in India must plan and implement. So what is a BRTS? For starters, BRTS or the Bus Rapid Transit System is a cheap, fast, efficient &systematic usage of Buses as a mode of transporting people from one point to another. It differs from the go-as-you-like road-rash set up currently reigning in our cities mimicking the F1 race-course, where all drivers are certified desperadoes. BRTS, in principle, lays out exclusive channels for the buses to ply, thereby segregating it from the regular traffic. Simple? Not so quick mates, it could well turn out a disaster if you underestimate our citizen's ability to throw rules into the air. Look how the BRTS got screwed left, right & center in Delhi..
First things first, the BRTS as we see in Western nations cannot be implemented here. 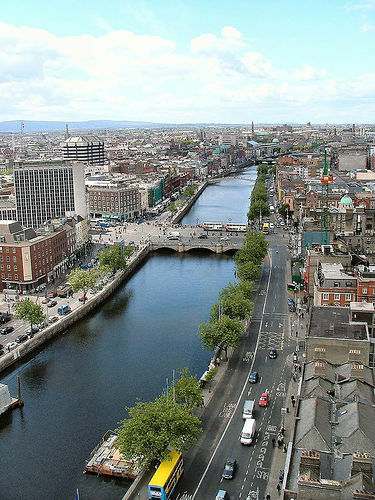 Forget it.. Look at Dublin and see how the BRTS functions as it should. Exclusive lanes, segregated bus bays, two-laned counter-flow bus-ways... Can our spar youth and the self-applauding biggeties in those swanky new cars resist that empty bus lane when in a choke-a-block situation? I'd bet most of them couldn't. But even the author of the above New Delhi article and the media in general fail to see the picture in the long run.. The benefits of something like BRTS in the overall traffic scenario of a city. See the video below to get a clearer picture. From the examples worldwide, sacrificing a lane or two for exclusive public transport has actually benefited the city in the long run. It was possible to inculcate more disciplined driving and the effectiveness of the system actually helped reduce traffic and improve the quality of life in the city. Trivandrum, hopefully plans to emulate such success stories. Now can something like BRTS be successful in Indian settings? In New Delhi there are fines upto Rs.5000 for driving on bus lanes. Well, we have laws in place to check speeding, travel sans helmet & seat belts. And who checks these laws? If the authorities are lax in implementing the adherence to bus-lane laws strictly then I'd bet my house on the failure of this system. Fellow blogger and friend Nishanth Nair was elaborating on the BRTS system in his new city, Brisbane, Australia where the buses follow atom-clock punctuality. The BRTS in Brisbane has underground bus stations, exclusive roads, flyovers, tunnels and special lanes for plying. We as a less affluent nation cannot afford such luxuries, especially for experimenting, but it is a matter of using our resources most effectively. Perhaps we need to take a leaf out of countries like Brazil where the BRT system is implemented at a fraction of the cost of other MRTS. 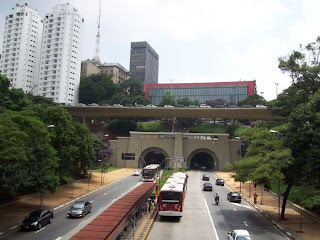 The most efficient BRTS system in the world is said to be in Curitiba, Brazil, which is replicated across the South American cities. I dug into the www for more on Brazilian road culture and sadly it is not like us, ie they're more ruly. Take a look at the above pic of Sao Paulo traffic and you can realize how hard is it to replicate such driving pattern in out cities. A huge improvement from the Curitiba system was implemented in the city of Bogota, Columbia, which currently sits as a reference to similar systems around the world. The Bogota BRTS, called TransMilenio has been such a huge hit that even the Mayors of New York, Chicago and the likes visited the Latin American town to get some lessons out of it. Trivandrum BRTS has a concerning handicap if you see the above videos. The roads are nowhere as wide as it is in Ahmedabad or Delhi, leave alone Bogota and Dublin. Throw in the haphazard driving and scant disregard for traffic laws (though not as disastrous as Delhi), there must be a serious effort to consider our driving culture before the BRTS is implemented. Otherwise we will have another Delhi on our hands with the public and media conspiring to bring the system down. We have a handful of examples on our hand where perfectly legitimate and productive projects have been dismantled by the combination of ill-informed citizens, bad press, vested interests and political foul play. BRTS Trivandrum could be a benchmark for the transport revolution in Kerala and we can't afford to mess it up to short-sight and bad planning. In Ahmedabad, a group of politically backed ruffians damaged the BRTS stations and buses just because they had to take a half-kilometer detour because the road in their locality became one way for the BRTS route! Such incidents must be dealt with iron fists and the sections of society including private buses, autowallas and taxi unions must be taken into confidence before the flagging off of the first bus. So how about the plans for Trivandrum? Trivandrum plans to use its 150 buses from JNNURM on 3 corridors. Presently a bus takes 20 min to traverse the 7km East Fort- Ulloor section, and at peak time it could be 45 min. Also keep a tab open for the ubiquitous marches, dharna, shakthi prakadanam and all sorts of jokes in front of that Secretariat, so its actually anyone's guess when you'll be able to reach your destination in Trivandrum on a given day. In Phase I, the authorities plan to implement the BRTS system on the 29km long Kazhakkuttam (Technopark)- Ulloor- Karamana- Balaramapuram stretch, all along the existing NH 47. They plan to have exclusive flyovers for the BRTS on some reeches but not the whole length will have exclusive bus lanes for a start. Interestingly, only 10 km of the whole length have at least a 4 lane width. Karamana- Balaramapuram and Ulloor-Kazhakkuttam stretches are still modest 2 lane roads, that's about 2/3 of the proposed stretch. Trivandrum BRTS Phase I: The 29km corridor is planned all along the NH 47 marked in blue, the red line is where the roads have 4/6 lane width. A system like BRTS will be successful only if the other traffic are clinically segregated. So one would normally assume that the BRTS will be implemented on these stretches only after the roads have been adequately widened which immediately puts a big question mark on the time frame of the project. As for Kerala, land acquisition = court cases = stay orders = indefinite delay in projects. 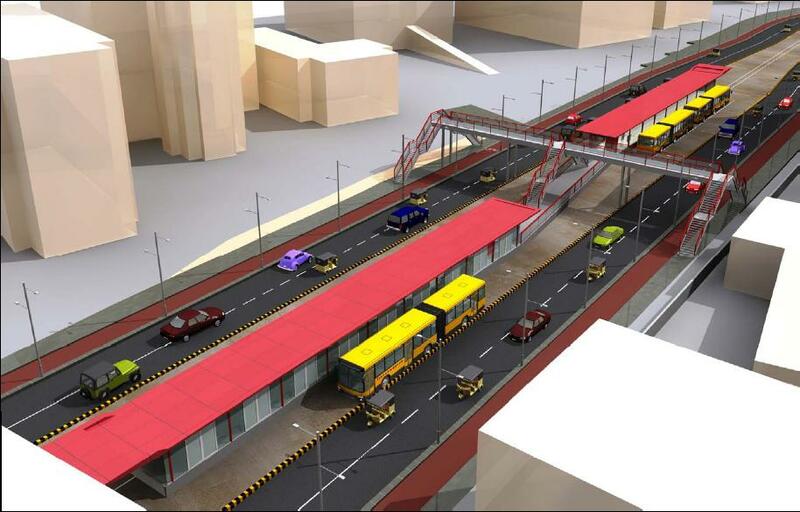 Those concerned say that not the whole stretch of the BRTS will have exclusive lanes, that means routine traffic and the buses will share the road width on approx 15km of the proposed system. Another issue could well be the parking as businesses along the highly commercialized avenues would mind more than a bit when the street parking is sacrificed for bus lanes. Parking plazas, expanding the by-lanes for parking and similar options may well be explored to sort this out. We don't want more lobbies to work against the system, do we? The Sreekaryam-Ulloor stretch of the NH 47 has become a nightmare, traversing that 3km was a pain in the backside even on my scooter, with a Delhi-like traffic, so how 'bout these supermodel buses? Flyovers are the plan here, say the authorities,but not all the 2-lane stretches will have the flyovers. It is not clear which stretches would be taken up for the next phases of the project but it all depends on how well Phase I works out. Fingers crossed on that, but it needs a big mindset change for our motorists not to get intimidated by the big aanavandi zipping along when they're stuck at deadlocks. Remember, this ego played a good part in messing up the Delhi BRTS. It would also be a good idea to bring in some brand image to Trivandrum's Bus system. At present things are not so appealing. There are at least half a dozen varieties of KSRTC buses plying on the city streets, from that Yellow ones to the Green coloured so-called Fasts; there are some White coloured buses as well. Its all confusing when you see the Private buses with indifferent inconsistent colour codes. It is a chance to bring in some professionalism to the BRTS by constituting an independent transport body for the city, call it Trivandrum Urban Rapid Transit or whatever you like. Have a uniform colour code for the buses, modernize and synchronize the ticket issuing. Make things more appealing for the public, sell the WOW factor! We should not be short sighted when it comes to visualizing the growth of the city as well, something which we have never done. Let the authorities plan and develop our roads with BRTS in mind and not leave us scratching our heads looking at the one-and-a-half lane dual carriageways we got as a result of a hind-sighted road development programmes. The BRTS should also be planned so as to evolve all along the city corridors and in future, may be as a feeder service if the city feels the necessity for a bigger and better transit system like the Metro. Not in the immediate future but still something to keep in mind when we plan for tomorrow. This could also be a unique opportunity to find some fund to construct a decent City Bus Terminal on that sprawling space owned by the Corporation on Attakulangara Bypass. Currently that dilapidated and long bus shelter adjoining the Fort is called City Bus Stand. Now for a capital city of the #1 state of the fastest growing economy in the world, is it enough? Perhaps this could be a showcase for the new face of Trivandrum to the outer world, a BRTS sure is fashionable!